In yesterday’s post about eating seafood, I mentioned that after eating we went for a stroll through the adjacent market. Nongmon Market is in Chonburi province, a coastal province southeast of Bangkok. Like all markets, there is a lot to see, plenty of pictures to take, and not a few things to try eating … if you are brave enough! A view down one section of the market, which stretches over several blocks. 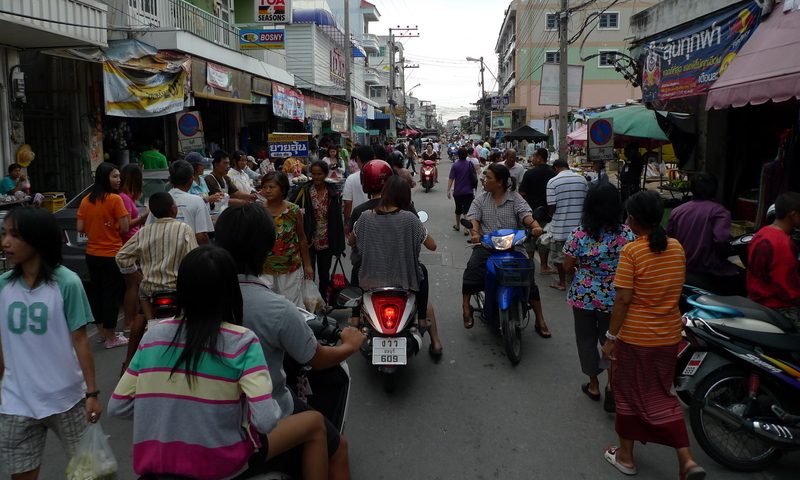 It is a busy place and if you aren’t careful you could easily get run down by a motorbike. It is all about the fresh seafood. 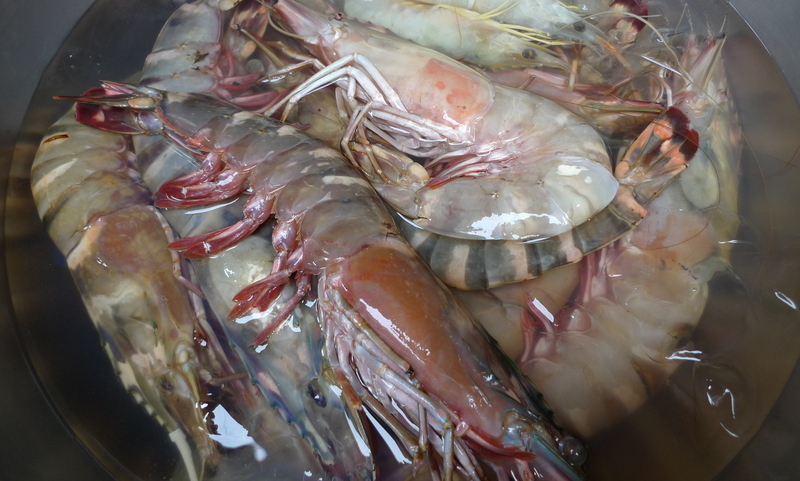 Here are some very large prawns, ready to be grilled. There are many kinds of fish available. 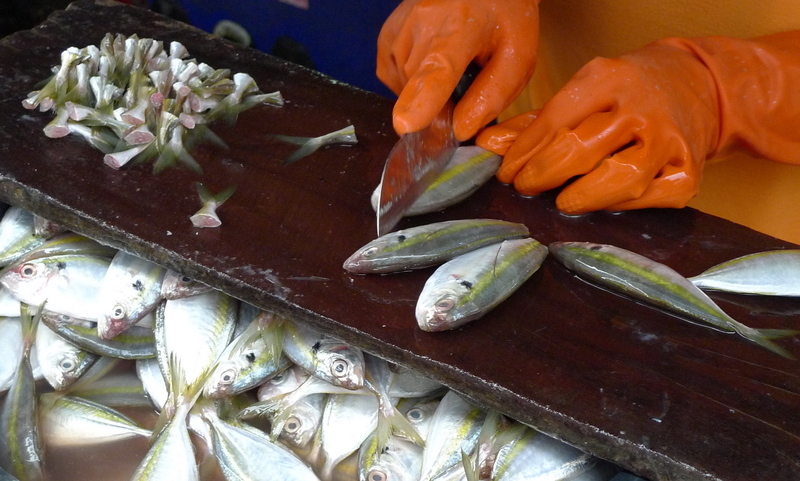 I watched for a minute as this skilled fishmonger quickly cut the tails and fins off the fish, moving as rapidly as a machine. 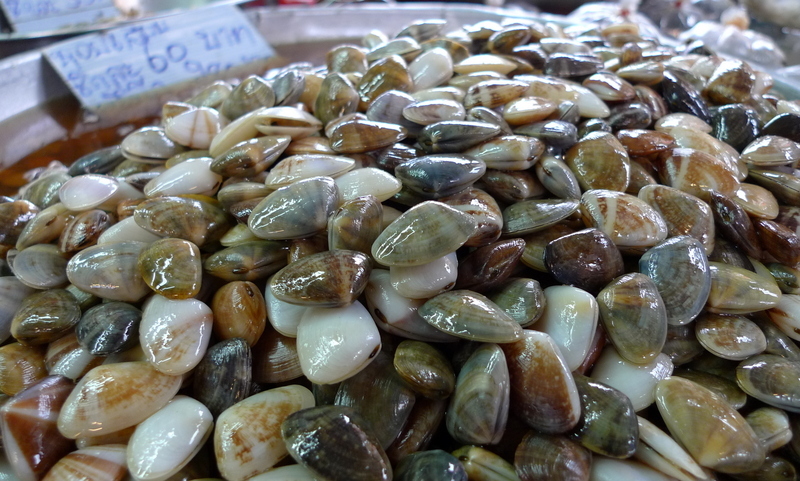 There were bushels full of hoy dong – marinated/pickled clams that are a popular dish. 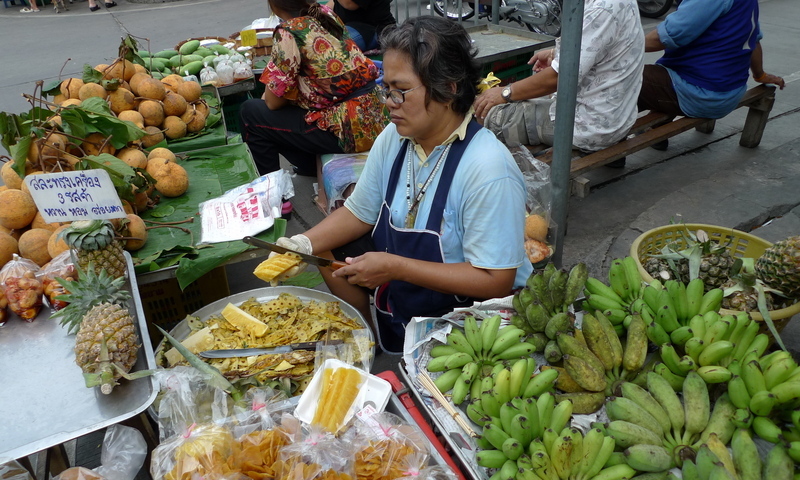 Lots of vendors sell hor mok – a fish mousse steamed in a banana leaf or mussel shell. Tawn made this for me using salmon shortly after he moved to San Francisco in late 2000. It was tasty, but I have to say that he struggled to find a banana leaf to use. 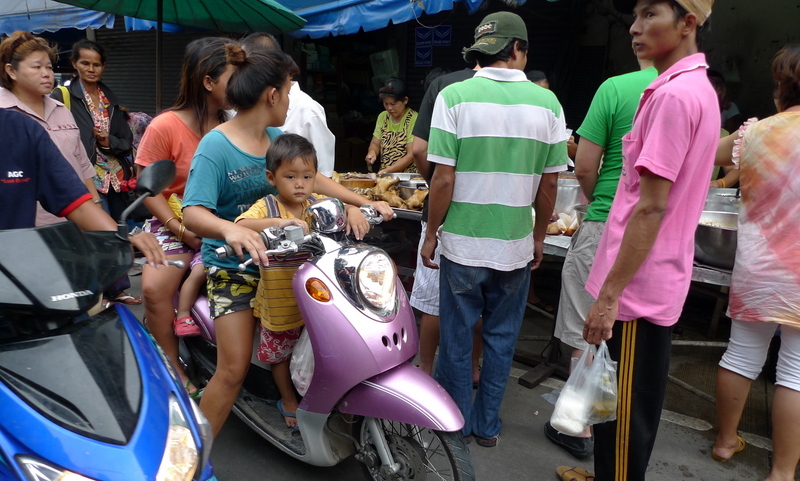 Visiting the market is fun for the entire family – especially when you can get four members of the family squeezed onto a motorbike. See the second child in there? 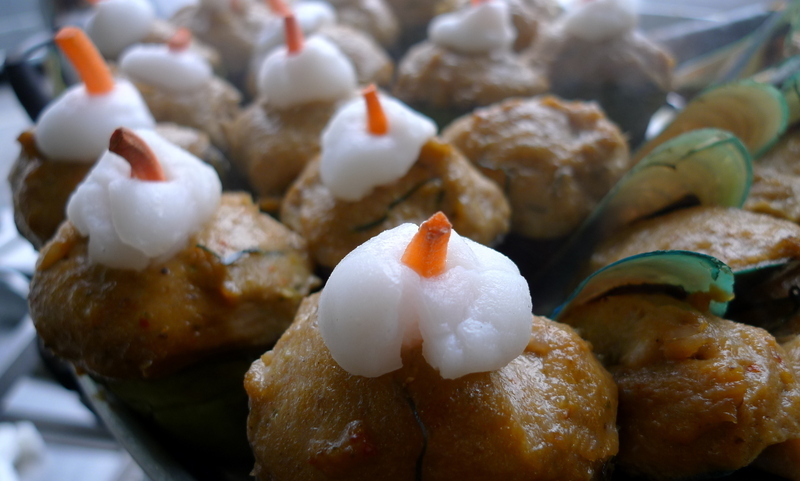 A sweet treat called khanom jaak – The leaf is”bai jak”, a type of palm frond. 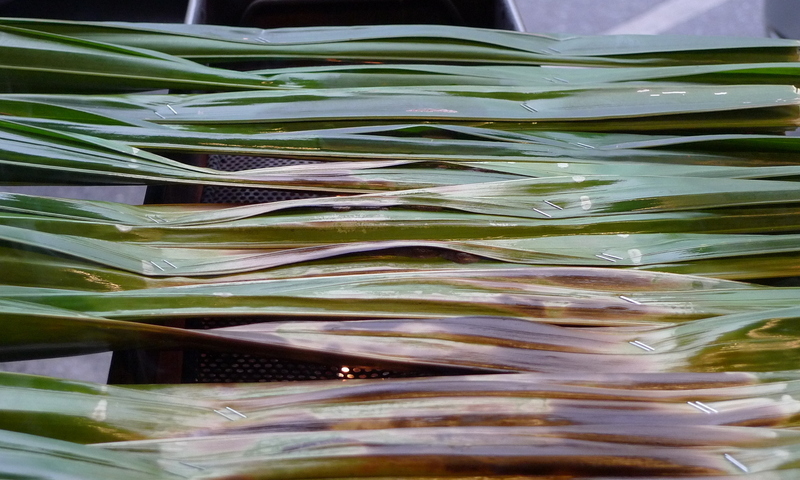 A mixture of shredded coconut, palm sugar, and coconut milk is folded inside the leaf then it is grilled until it becomes a sticky, toffee-like mass. Tasty stuff. Watch out for the staples. 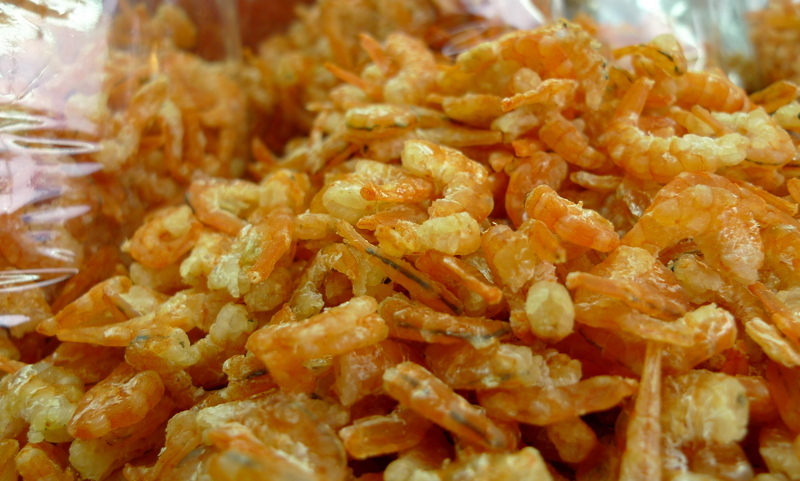 Dried shrimp – Thais use these in dishes like nam prik (chili dipping sauce) and som tam (green papaya salad) to add a salty and fishy flavor. A fruit vendor slicing up fruit to go. The orange fruit above the pineapple is called gratawn – a summer fruit with a bitter, tangy exterior layer of flesh. Closer to the seed it is very sweet with a cottony flesh. The bananas in the lower right are known as gluay nam waa, which has a sticky flesh similar to a plantain. There are many different varieties of banana here. Finally a dessert called khanom chan – “layer dessert” – a jello-like dessert, very auspicious for promotions and other things where you go up a level. 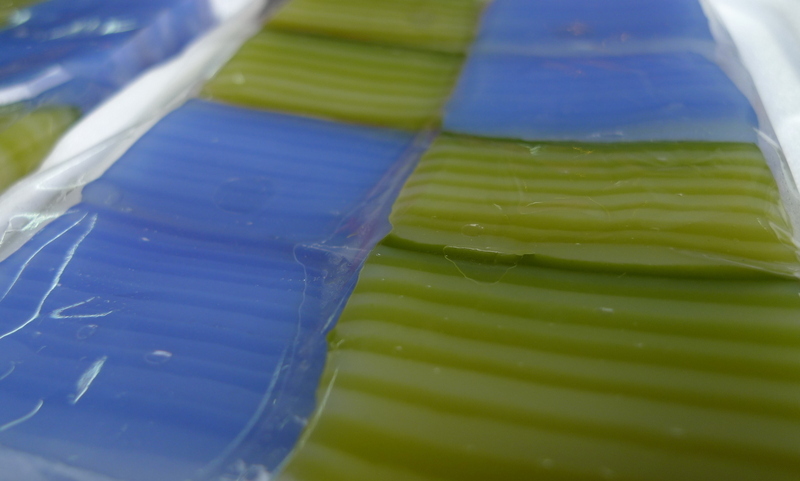 The green flavor is pandan leaf and blue flavor is an-chan, a type of flower also known as clitoria ternatea. I hope you enjoyed the stroll through the market. Tomorrow, a retro 60s meal back in Bangkok. This entry was posted in Uncategorized and tagged Chonburi, food, Market, Nongmon, Thailand by christao408. Bookmark the permalink. A motorcycle ran over my foot last time I was in Thailand. So be careful is an appropriate warning. Btw, after you mentioned it, it still took me a double look to find the little girls foot in the middle of human pyramid on the move. What I enjoy the most is the many great exotic pictures with the explanations. Many thanks! Thanks for uploading these! I love seeing what markets sell in other countries. 🙂 Here we mostly have uninteresting, identical supermarkets that sell mass-produced and often highly-processed food with terrible carbon footprints. There are some farmers’ markets, too, but they tend to be prohibitively expensive for someone like me. @Chatamanda – You’ll be interested in knowing that we actually have helmet laws in Thailand, too. They are rarely enforced outside of Bangkok, though. @stevew918 – Yes, each time I write about motorcycles in Thailand, I think of your unfortunate incident Steve. @Senlin – You’re funny, Senlin. I love the rant and I agree completely. If only I could find some of the veggies from US farmers’ markets here in Thailand. My girlfriends and I are thinking of making a weekend trip to Bangkok for some shopping, food and massage. It has been more than a year since our last trip. It seems safe enough to go now isn’t it? @icepearlz – It has been safe the entire time, even during the political unrest. There was some inconvenience during that time but short of running into a crowd of demonstrators, there was no risk to tourists. Life is back to normal here and everything (with the exception of one mall) is up and running. Please come and enjoy! Oh wow! Look at the clams- they look like pebbles! Beautiful shot. There is a desert, it’s a little gross sounding and looking, but I love this stuff. It is a cold coconut milk soup with gummy worms in it. What is the name of it and how do you make it? @Dezinerdreams – They really did look like a bowl full of pebbles. @amygwen – I know what it is but will have to ask Tawn about the name and how it is made…@CurryPuffy – Hor mok is actually a really nice dish. I like the name of the flower haha.Took me awhile to find the leg of the second child. @bejewel07 – Missing in action, that’s for sure! @yang1815 – It looks like one, or so I’m told. @christao408 – Well it does haha.